Over 11 years after making his debut in WWE, Kofi Kingston is now a world champion. In beating Daniel Bryan on Sunday night at WrestleMania 35, Kingston not only reached a career milestone but made WWE history as well. The WWE championship, which the company debuted in 1963, had been around the waist of 50 different men in its history. 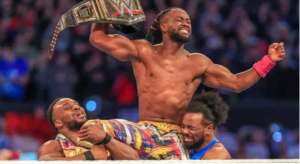 Kingston on Sunday became just the second African American (following Dwayne “The Rock” Johnson) and first native African to hold WWE’s signature title. As is occasionally the case in WWE, Kingston’s elevation to the WWE title match at WrestleMania was a classic case of fans forcing the company to change its plans. Kingston, a longtime fan-favourite both as a singles competitor and member of popular tag team New Day, filled in during a gauntlet match for an injured superstar (Mustafa Ali) and nearly won despite starting the bout in the ring. Kingston pinned Bryan to open that match. H then nearly won an Elimination Chamber match for the WWE title in booking that was supposed to mirror the plan for Ali. While Ali was reportedly supposed to main event Fastlane against Bryan with a returning Kevin Owens planned to be Bryan’s ‘Mania opponent, the overwhelming fan support Kingston gained during those aforementioned matches forced the company to change its plans. Owens and Ali (inserted as a last-minute challenger) lost to Bryan at Fastlane with Kingston eventually earning his title shot at WrestleMania.